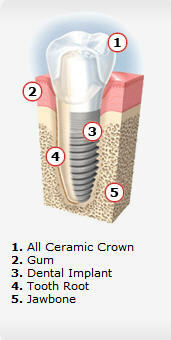 What is a implant crown? How much do implant crowns cost? How will implant crowns affect my life? How much time is required for a implant crowns placement? How will I care for my implant crowns? Escondido Dental Implants - Anyone who is missing one or more teeth due to injury, disease or tooth decay may be a candidate for dental implants. The dental implant is stable and comfortable. No adjustment is needed after placement. Normally, it will serve its owner for life.